A signed and numbered print from an original painting by Daniel Vancas, original painted on the historic Gil Elvgren 1930s easel. I classic pinup for today and timeless.. This Soda Fountain or Diner Girl has an unexpected accident with strawberry ice cream! Cute pin-up exposes a little nylon stockings and garters with her surprise and still is very innocent! You can also request a larger size on canvas or even a custom pinup original painting from the artist, Daniel Vancas. DANIEL VANCAS IS THE AUTHORIZED ELVGREN PIN-UP REPLICA ARTIST! ONLY A LIMITED NUMBER SOLD AT THIS PROMOTIONAL PRICE! (c) 2010 -2011 All rights Reserved. The Original painting has been sold! A Great gift for those into Diner, burger joints, Ice Cream, Coca-Cola, Coke, Hot Rods, retro wear, vintage clothing, W.W.II and Korean War bird, nose art and aviation collectors; and of course those that love their Martini, swing, RAT PACK, Sinatra, Elvis, Marilyn and Rock A Billy set. Would look great by the dresser, pool table, bedroom, bathroom, game room, and with 1930's art deco furniture, original paintings and sculpture. ALL OTHER ELVGREN PAINTINGS shown as samples are already SOLD! Daniel Vancas is a fine artist and fine art publisher of limited editions. Known mostly for his work in pinup, illustration, aviation and automobile art. He was the very first publisher of fine art Elvgren limited editions, and also the very first to commercially offer high-quality Elvgren Replica paintings. He promoted Elvgren for 14 years at his own expense of $1,000,000. Before Elvgren was rediscovered in the late 1990s and well before most of those popular new books came out, Daniel Vancas Owned and opened several Vanguard Galleries promoting Elvgren! He paid for shows all around the country promoting Elvgren pinup. He was the first to open Elvgren websites in 1993 & 94. Because an estimated 40% of all of Elvgren's paintings were thrown away and lost, and because the found ones are rarely are for sale, unless offered at $75,000 to $150,000; Daniel Vancas was the first to paint the replicas of Elvgren pinups for the public, using mostly the destroyed, lost and unavailable Elvgren images. In this way he has faithfully and lovingly preserved many now lost works of art for another generation. At first, he was licensed with B&B, now he owns his own separate elvgren Intellectual Property. 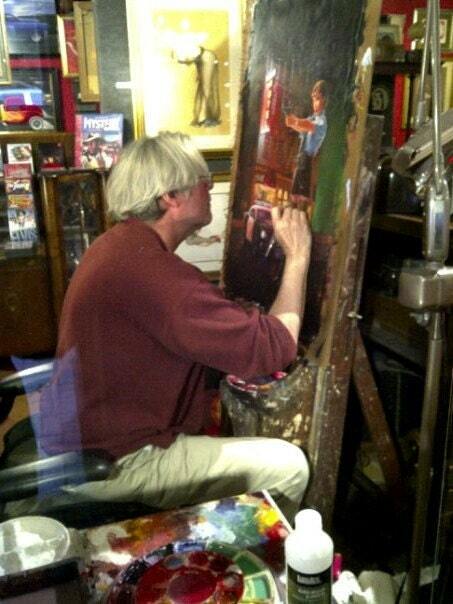 Over the years he was also licensed by the VARGAS ESTATE and bought and sold many vintage original vintage pinup paintings by Elvgren, Vargas, Petty, Moran and many others. Many celebrities and actors have been to his shows and gallery openings. Daniel Vancas painted over 238 ELVGREN REPLICA PAINTINGS! He has signed and dated back of each one, so they will never be confused with the original vintage painting by Elvgren. The reason you don't often see them for resale is that the collectors of these paintings keep them. Most are sold through galleries. Daniel Vancas is listed as a Vero I.P. Property Rights Owner with E since 2001. His Elvgren TM has been approved and accepted as the separate ownership of Daniel Vancas, as agreed with B&B in permanent and final agreements which were made order and recorded in Federal Court March 2001. Per this order licensee's or their 3rd parties of B&B, such as art dealers, authors, book publishers may NOT disrupt, slander Mr. Vancas art business and/or I.P. (Which includes this auction, slander on his name and products, his lawful trademarks and derivative artist copyrights on apx 130 Elvgren images, paintings, prints etc.) This being said this mark was reconfirmed and re-issued by the Federal Trademark and Patent Office after they LOST (due to unknown internal loss or theft) Daniel Vancas' 5 year filing and use statement along with a major portion of his original TM files. There was not cancelation of registration for any other reason. Because of his documented confirmations, use and supporting court order, the TM registration was promptly re-issued to Daniel Vancas. All this effort and money spent to support Mr. Vancas' Elvgren I.P. is to support the values for the collectors of these beautiful fine art paintings as well as preserve Mr. Vancas' rights, first efforts, investments and development of the Elvgren pin-up revival started by his hard work and tireless effort. When he started to promote Elvgren 14 years ago, people would ask, who in the world is Elvgren? 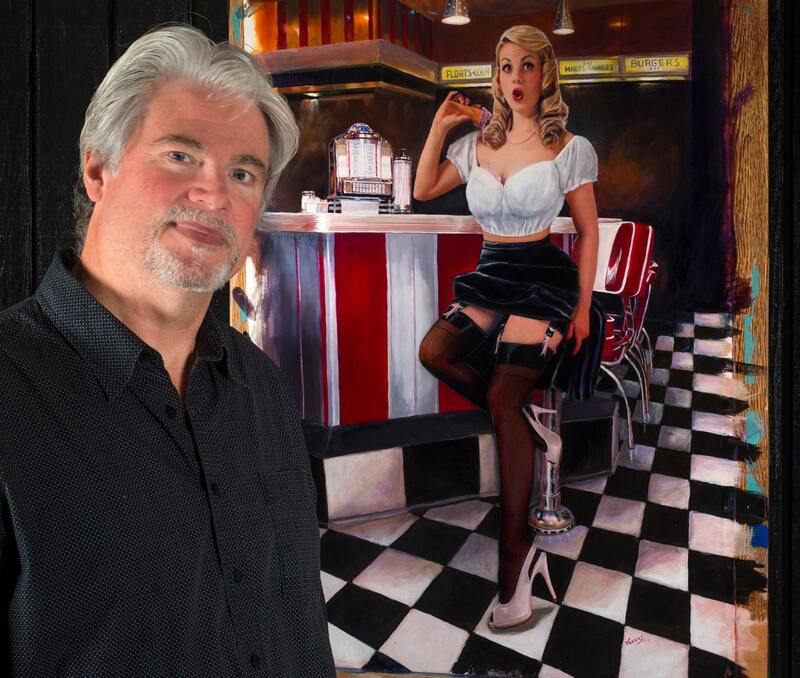 Mr.Vancas has answered that question by devoting the largest part of his artistic effort to demonstrate why Elvgren is one of the great artists of the American 20th-century pop art and culture iconic. Not just to confine him to the smaller circle of pinup collectors.